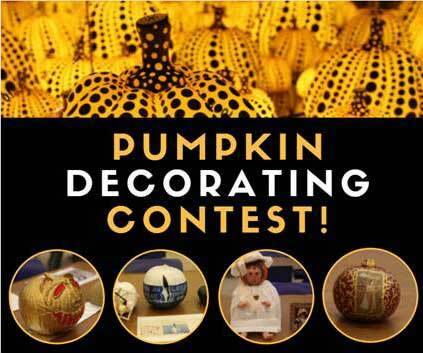 To celebrate the opening month of their exhibit “Yayoi Kusama: All the Eternal Love I Have for the Pumpkins” and Halloween, The Dallas Museum of Arts invites you to participate in an artistic pumpkin decorating contest! Post a picture of your DMA collection inspired jack-o-lanterns in the comments of this post on the DMA Facebook to participate. Post your pumpkin by October 30, winners will be announced on Halloween Day. More than one pumpkin may be decorated if needed to recreate a work of art in the DMA collection. Winners will be decided by popular vote (AKA, whichever pumpkin pictures gets the most likes wins). The 3 pumpkin decorators with the most likes will each receive two tickets to “Yayoi Kusama: All the Eternal Love I Have for the Pumpkins”.